1/4 CT. T.W. 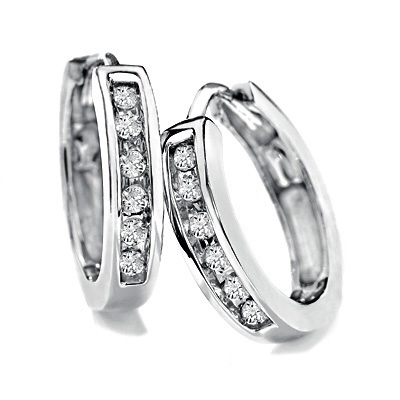 Diamond Huggie Hoop Earrings in 10K White Gold In the most charming and adorable of earring styles, these 10K white gold small huggie hoops are absolutely perfect for everyday wear. 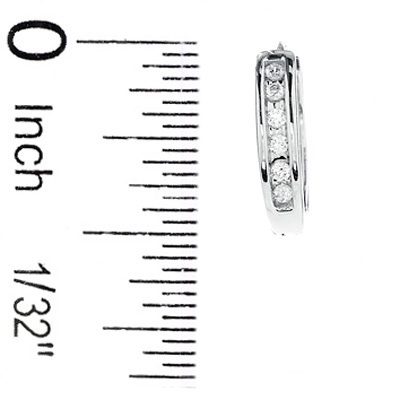 Six round diamonds totaling 1/4 ct. snuggle in a channel setting and provide an unsurpassed amount of luminous impact. These latchback earrings are simply a must-have for your jewelry wardrobe. PRODUCT SPECIFICATIONS Stone Type	Diamond Stone Shape	Round Diamond Total Weight (CT. T.W.) 1/4 Gold Karat	10K Back Type	Friction Lifetime Diamond Commitment	Yes Metal Color	White Metal Type	Gold Stone Color	White Diamond carat weights (CT.) represent the approximate total weight (T.W.) of all diamonds in each setting and may vary no more than .07 below the stated weight. Typographic errors are subject to correction. Merchandise enlarged to show detail and may not always be exactly as pictured. Promotions, prices, styles and availability may vary by store and online.